The latest desktop Mac operating system from Apple i.e. macOS Sierra 10.12.5 has already been released to the general public worldwide for Mac device users. 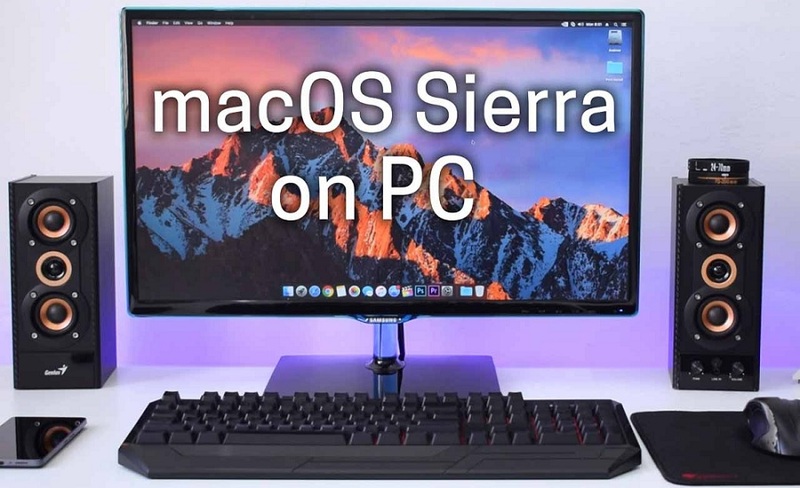 But if you're using Windows-powered desktop PC or Laptop, then you can have an option to Install macOS Sierra Hackintosh on PCs and Laptops for Free. By using the most popular MultiBeast and UniBeast tools available for Intel-based computers commonly used for Windows OS, non-Mac users can experience all the features and functions of macOS without investing on a Mac computer. Below we are sharing a detailed Step-by-Step guide and tutorial to Free Download and Install Hackintosh macOS Sierra on PCs and Laptops powered by Intel chipset. Access to a Mac device for preparing the UniBeast USB Drive. Access to a PC powered by Intel to Install macOS Sierra. Full back up of your device data on which you're going to install macOS Sierra Hackintosh. Download macOS Sierra 10.12.5 DMG File without App Store. Download UniBeast or MultiBeast Tool via tonymacx86 Website. How to Install macOS Sierra Hackintosh on Intel PC/Laptop? Step # 1: Free download macOS Sierra and UniBeast tool latest version via above provided direct links to create the bootable macOS Sierra drive. Step # 2: Now with the USB drive plugged into any Mac, launch the Disk Utility app and make sure that the drive is selected in the information pane on the left. Step # 3: You now need to erase and format the USB drive as mentioned earlier. With it selected, click on the Erase button on the toolbar atop, and enter a name for the drive. You can name this whatever you like, but make sure that “OS X Extended (Journaled)” is selected as the Format, and “GUID Partition Map” is selected for Scheme. Finalize the process by clicking the Erase button and then exiting out of the interface by clicking the Done button. Step # 4: Now run the downloaded UniBeast program and click on Continue a few times before you get to the part where it asks you to Select a Destination. Make sure that the recently formatted USB is selected, and then click on Continue again to progress. Note: When UniBeast runs for the first time, it will look for the downloaded macOS Sierra installer file in /Applications folder, and if not found, it will prompt you with an error. Typically, macOS should have downloaded the file to that exact folder, but in case you get that error, make sure that “Install macOS Sierra.app” is within the /Applications folder or for that matter, the file name isn’t changed. Step # 5: When asked to choose on Select OS Installation screen, make sure you choose the Sierra option and click Continue. Step # 6: When the installer comes to Bootloader Configuration screen, either choose UEFI Boot Mode, or Legacy Boot Mode. Either one will be fine, so once selected, click on Continue to proceed. Step # 7: The next screen, Graphics Configuration, is optional, so if you wish, you can choose the appropriate graphics settings that will get the best performance out of the system that you are installing macOS Sierra onto. Step # 8: Next, you will be asked to enter your Mac’s password for UniBeast installation to begin. Once entered, click on the Install button to continue. UniBeast will now run through the process of creating the bootable macOS Sierra installation drive for your Hackintosh. This could take about 10 minutes depending on your system and drive’s speed. Step # 9: You’re now going to need to download the MultiBeast tool for Sierra from the same place you downloaded UniBeast tool in Step 2 above. Once downloaded, move the MultiBeast file onto your now UniBeast-ready USB drive. Step # 10: Once you are done with all that, it now comes to the main bit of actually installing the operating system onto a compatible Intel-based Hackintosh PC. Plug the UniBeast USB drive you made above into your PC and turn it on. Hit the hotkey when booting to make sure that you get into the system boot menu that allows you to choose a source disk to boot from. This is, of course, different on different types of PCs but is usually accessed using F8, F10, F11 or F12 key on the keyboard. Step # 11: Once you are into the boot menu, make sure that your USB drive is chosen as the drive to boot the system from. When you get to the Clover boot screen, make sure that you choose Boot Mac OS X from USB option. Yes, we know, it’s supposed to be macOS now and not OS X, but we’ll excuse the naming ignorance in this instance. Step # 12: Soon you will arrive at macOS installer screen. If this is a new installation of macOS, then you are required to format the main hard drive that it’s being installed on to. From the menu bar on the top, navigate to Utilities > Disk Utility. Highlight the target drive in the left pane, and then hit the Erase button. If this process is starting to sound a little bit familiar, it’s because it is basically what we did for the USB drive earlier in the process. Choose “OS X Extended (Journaled)” and “GUID Partition Map” for Format and Scheme. Hit the Erase button to complete the formatting process and then close Disk Utility. Step # 13: Now simply run through the process of actually installing macOS Sierra on your PC. Step # 14: When the installation is complete, the system will automatically restart. At boot, press the relevant hotkey on the keyboard to get into the boot menu again. Step # 15: Choose USB followed by selecting Sierra at the boot screen and let the setup of macOS Sierra complete. Step # 16: Once the setup is complete and you are into macOS Sierra desktop, run the MultiBeast tool to install the required missing drivers for networking, audio, graphics etc on your system. After all the required drivers using MutliBeast are installed, you will get the fresh and clean installation of macOS Sierra Hackintosh on your PC or Laptop powered by Intel. Congratulations!! You're done.